The bridge from the east is temporarily closed, please follow directions below. At the intersection of Highway 52 and Pole Line Rd (by Luther College in Decorah) turn WEST (off of Highway 52) onto POLE LINE Road. Stay on Pole Line Road for about 2.5 miles. Turn RIGHT onto BLUFFTON Road. Turn RIGHT onto SCENIC RIVER Road. Stay on Scenic River Road for about 1 mile. 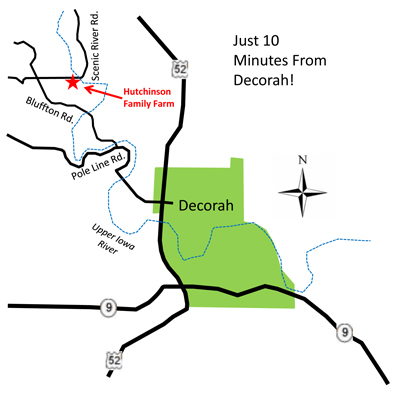 The Campground, Cabins, and Canoe/Kayak/Tube rentals are located on the RIGHT side of Scenic River Road, before the Upper Iowa River. SOME GPS AND INTERNET DIRECTIONS ARE INCORRECT!!! !